Natural menstrual pain and PMS relief from high-dose standardised herbs. 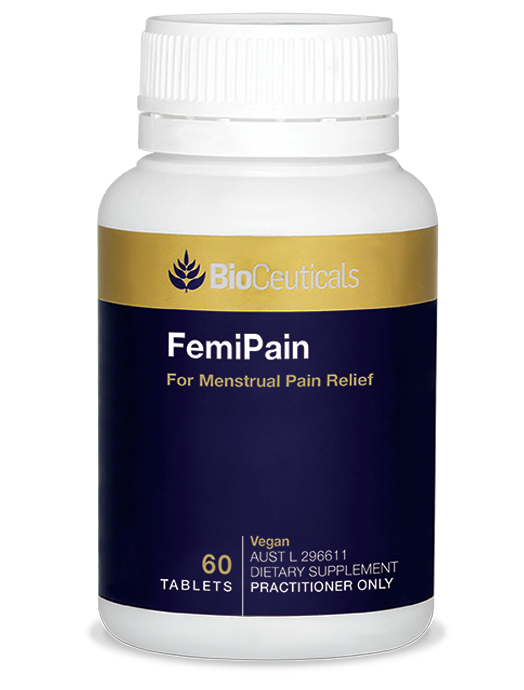 FemiPain combines zinc and vitamin B1 with ginger, cramp bark, black cohosh, corydalis and Jamaican dogwood to relieve menstrual pain. FemiPain combines zinc and thiamin (vitamin B1) with herbs traditionally used in western herbal medicine (WHM) and traditional Chinese medicine (TCM) to relieve menstrual pain. Ginger is traditionally used in WHM for its anti-inflammatory and carminative actions in the body that support the management of dysmenorrhoea and reduce symptoms of abdominal discomfort and dyspepsia. Cramp bark is traditionally used in WHM as an antispasmodic to relieve muscular tension and spasm as well as uterine menstrual cramps associated with dysmenorrhoea. Black cohosh (standardised to triterpene glycosides NLT 2.5%) is traditionally used in WHM to relieve premenstrual symptoms, reduce the pain associated with menstruation and ease nervous tension. Jamaican dogwood is traditionally used in WHM as an analgesic for neuralgia, migraines and dysmenorrhoea. It is also used to support the nervous system and provide relief from insomnia. Corydalis (standardised to 10% alkaloids) is used in TCM to reduce pain associated with menstrual cramps and dysmenorrhoea, and is used to invigorate the blood and regulate qi. Vitamin B1 supports normal energy production. Adults: Take 1 tablet three times daily or as directed by your healthcare practitioner. Take two to three days before menstruation and the first one to two days of the cycle. In very rare cases black cohosh has been associated with liver failure. If you are experiencing yellowing of the skin or whites of the eyes, dark urine, nausea, vomiting, unusual tiredness, weakness, stomach or abdominal pain and/or loss of appetite you should stop using this product and see your doctor.